Nowadays, it's quite common to hear of friends suspecting they (or their children) may be lactose intolerance when they get an upset stomach after taking cheese, milk or other dairy products. This article sheds some light on what is lactose intolerance all about and suggests a very simple, effective solution should you really be unable to tolerate lactose. Lactose is a type of sugar that is normally found in milk and related products. Lactose intolerance occurs when a person is unable, or has insufficient ability, to digest this sugar. It is caused by the lack of an enzyme called lactase. Lactase breaks lactose down into glucose and galactose, 2 simpler forms of sugar which are then easily absorbed into our bloodstream. This condition is referred to as lactase deficiency. What else causes lactose intolerance? Some people's immune system may develop some form of reaction to cow milk protein, resulting in their inability to tolerate lactose. This condition is called cow milk allergy. It is commonly confused with lactase deficiency. What are the different types of lactase deficiency? It may be genetically inherited. Usually begins after the age of 2, when the body starts to produce less lactase. This occurs due to an injury to the small intestine as a result of severe diarrheal illness, major burns, blood infections or chemotherapy. May occur at any age. The symptoms range from mild to severe, depending on the level of tolerance and amount of lactose consumed. 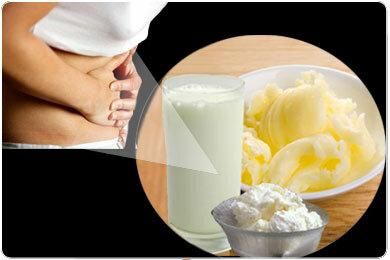 However, don't be so quick to assume you're lactose intolerance just because you get abdominal pains. It could be signs of other illnesses as well. What solution do you recommend? A high quality probiotics is very effective in increasing your tolerance for dairy products. Click here now to discover why Lacto-berry probiotics fits the bill. Don't deprive yourself any further. Email me at laifuiping@gmail.com to get your Lacto-berry probiotics.